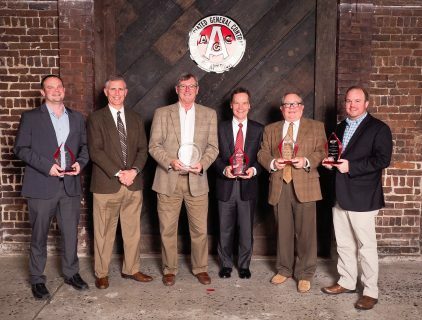 On January 18, 2018, Merit Construction was the proud recipient of four Associated General Contractors (AGC) Build Knoxville awards. The projects that received the awards were (in no particular order) UT Volunteer Blvd. Campus Beautification Phase 1, Lenoir City Utility Board Operations Center, Tennessee Cancer Specialists, and Tate’s School-Multipurpose Building. Congratulations to all the recipients. Great work Merit team. Special congratulations goes to Marv House for receiving the SIR Award (Skill Integrity Responsibility) and AGC of Tennessee Honorary Lifetime Membership. Published on January 25, 2018 by Buddy Heins. Thursday, January 19, 2017 – The 2017 Associated General Contractors of Tennessee Knoxville Branch Awards dinner. Merit is very proud of our team and all the projects we’ve been a part of. On this evening, we shared the privilege of receiving several awards. Merit won Infrastructure – $5 Million and Over for the Ripken Experience, Renovation – $5 Million and Over for John H. Daniel “The Daniel”, and 3rd place – Construction Safety Excellence Awards. It goes without saying, are industry is a proud, hardworking, and determined group of people. Congratulations to all the winners. Published on January 20, 2017 by Buddy Heins. Congratulations and thanks for all your hard work and efforts that went into the Merit projects that won Build Knoxville Awards last night. Published on February 12, 2016 by Buddy Heins. Merit Construction swept the Associated General Contractors of Tennessee-Knoxville Branch first Build Knoxville Awards, except one category won by Blaine Construction. The program honors AGC members who build the Knoxville region’s most impressive construction projects on criteria including state-of-the-art advancement, project management, innovation in construction techniques or materials, safety record, client service, community relations, environmental sensitivity and partnering excellence. Merit Construction won awards in three categories: Commercial under $5 million, Mountain Commerce Bank; Institutional, Alcoa High School and Industrial, ProNova Solutions. Published on February 01, 2016 by Buddy Heins. Congratulations! Merit Construction won the 2015 Construction Safety Excellence award in our category and has been selected as a finalist for the 17th Annual Willis Construction Safety Excellence Awards (CSEA). Merit now moves on to the national award judging which will take place March 6-9, 2016 during AGC’s Annual Convention in San Antonio, Texas. To receive periodic email updates on new and emerging projects from Merit Construction, subscribe to our e-newsletter, Merit on the Move.